I run mosaic workshops for adults and I am qualified to teach adult learners (City & Guilds PTTLS). Mosaic workshops can be arranged to explore the direct and indirect methods of making mosaics using a variety of materials or tailor made to suite a given project. I have worked with regional art societies, disadvantaged parent-child groups, cancer patients, mental health clients, learning difficulty clients, community groups and the general public. As a qualified Community Artist (having trained with Artlink, Hull) I am available for consultation and facilitation of public community art projects. 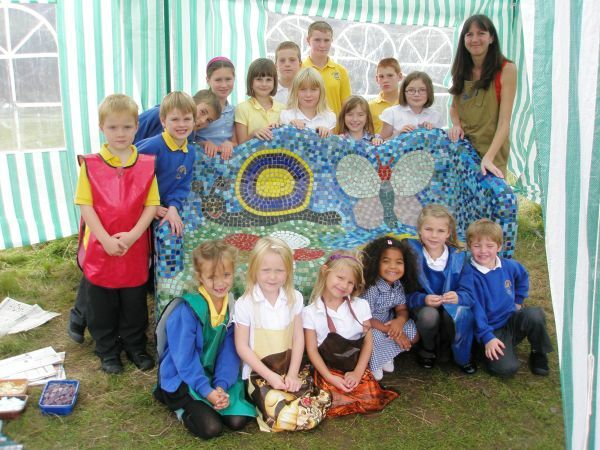 Projects include mosaic workshops and mosaic courses in schools, hospitals, museums, churches, art centres, galleries, children's centres and community centres. I hold a clear Disclosure & Baring Service Enhanced Certificate (formerly CRB check) available for inspection and have a certificate in Safeguarding Children (Level 1). If you would like to discuss a taught school session, mosaic workshop or community art project please send an email sue.kershaw@hotmail.co.uk or fill in the 'contact' form or call 07929 884759. Create a high quality mosaic in one day during my mosaic workshops near York. Price £55 including all materials and refreshments (please bring lunch). Learn how to design and create your own mosaics using the direct and indirect methods. Select from a huge choice of materials and colours and be inspired by a large display of mosaics, books and resources. You don't have to be able to draw to create mosaics! I provide many designs to choose from or you are very welcome to bring along your own design to fit a 22cm square base. Design tips and guidance provided. Full instruction on cutting and laying tiles and grouting. Leave with a helpful handout on where to buy materials and which glue to use for your next project. My mosaic workshops takes place at my home studio in Huttons Ambo, near York, North Yorkshire (set in the Howardian Hills, an Area of Outstanding Natural Beauty - and overlooking the stunning Yorkshire Wolds). Leave wanting to do more with free advice on future possible projects (including lamps, tables, floors, vases etc). Books and resources, including websites, and sources of materials will be provided for reference. I am also offering a further mosaic workshop to create a mosaic table in a day at Blacksmith Shop Crafts in Foggathorpe near Selby, East Yorkshire priced at £95 (including a beautiful home cooked lunch and all materials). •	We had a lovely relaxing creative day learning how to mosaic. The day suited all abilities - you could be a safe or adventurous as you wanted. Everyone went home with a fabulous result. The day was enjoyable, relaxing, creative, fun, therapeutic, highly recommended. •	Sue was an inspiration. Most people had never made a mosaic before but it was also the relaxed and happy atmosphere that contributed to a most enjoyable 2 days. •	What a most wonderful experience. Working with others as a group and learning something new. Being part of something important and watching a piece of work grow from the start is both exciting and fulfilling. •	I thoroughly enjoyed the workshop. The process was fascinating and creative; the colours, textures and designs were beautiful. It was great to be part of a team working on the large mosaic. •	Enjoyed it very much. •	Was planned very well indeed. •	Great fun – very relaxing. •	Enjoyed every aspect especially being taught all the basics before starting the real thing. Would love to do as a hobby at home. •	Love it – love it – love it! Sense of achievement. Being part of a special group activity. Something tangible to reflect on. •	The teaching was extremely professional, patient and fun at the same time as informative. •	The teacher was very helpful and friendly. •	The teaching and everything else was great. •	Sue was so enthusiastic, knowledgeable and approachable. •	The teaching was done with great care and attention to individuals attending. •	Excellent facilitator – patient and calm. •	Excellent teaching and allocated time. Permission was sought and granted to use these photographs.